A 93-year-old male was referred to the emergency department by his primary care physician for blood transfusion after outpatient evaluation for dizziness and generalized weakness for the past 2-3 days revealed anemia and hematuria. Of note, the patient also had a recent history of anemia requiring two transfusions during the preceding four weeks and was diagnosed with prostatitis six weeks earlier. Additional pertinent past medical history includes benign prostatic hypertrophy, chronic hematuria, chronic renal failure, recurrent symptomatic anemia, and remote cutaneous basal vs. squamous cell carcinoma. In the ED, the physical exam was unremarkable and initial labs demonstrated mild to moderate anemia, trace hematuria, and renal failure. 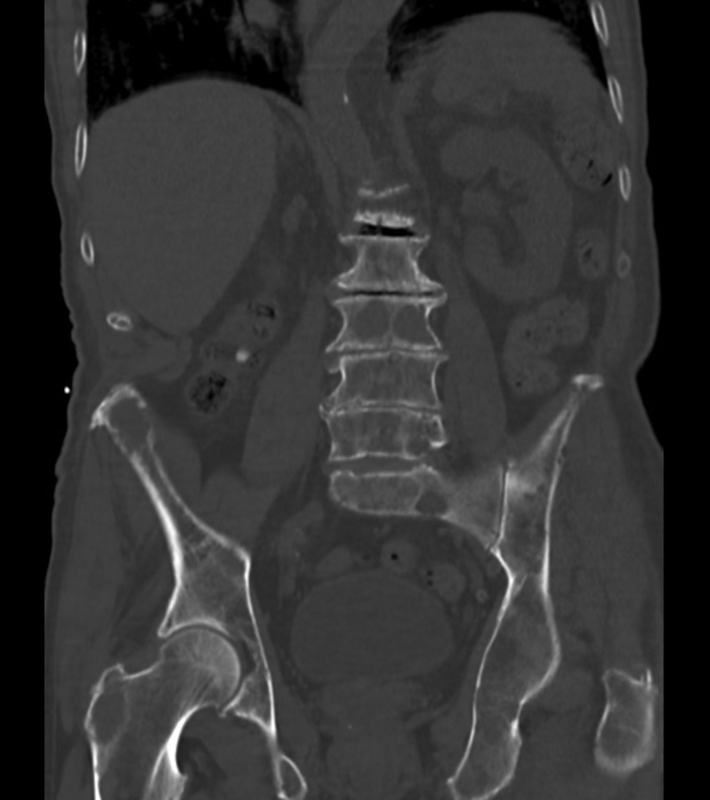 The patient was admitted for symptomatic anemia with urologic workup for hematuria. 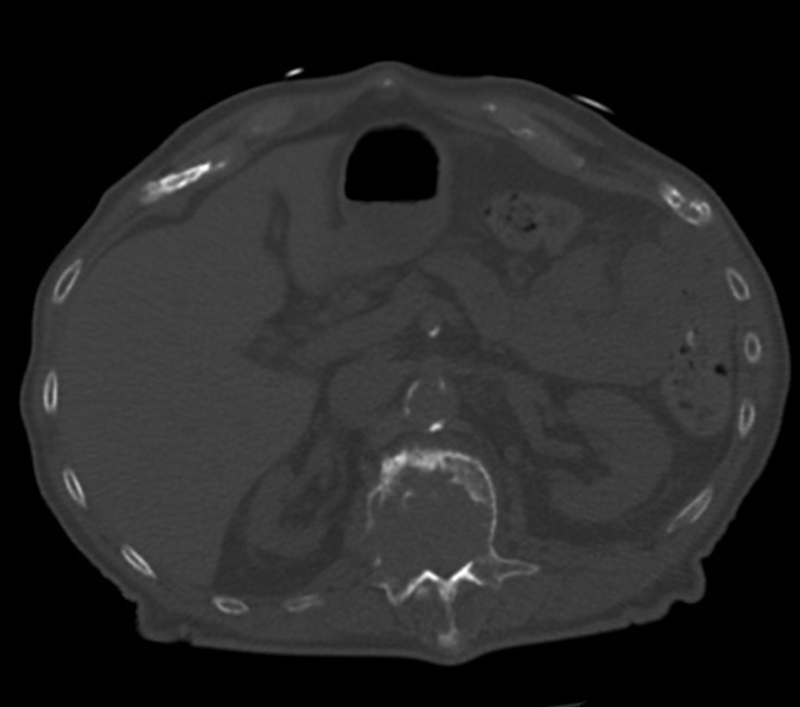 Incidental discovery of multifocal osteolytic lesions on subsequent nonenhanced CT (NECT) of the abdomen and pelvis prompted further workup for suspected metastases. On admission, initial NECT of the abdomen and pelvis demonstrated multiple osteolytic lesions in the pelvis, right femur, and lumbar spine with associated soft-tissue component and mass effect compromising the spinal canal at L1 (Figure 1). The following day, MRI of the lumbar spine and whole-body bone scan were ordered due to growing concern for metastatic disease. 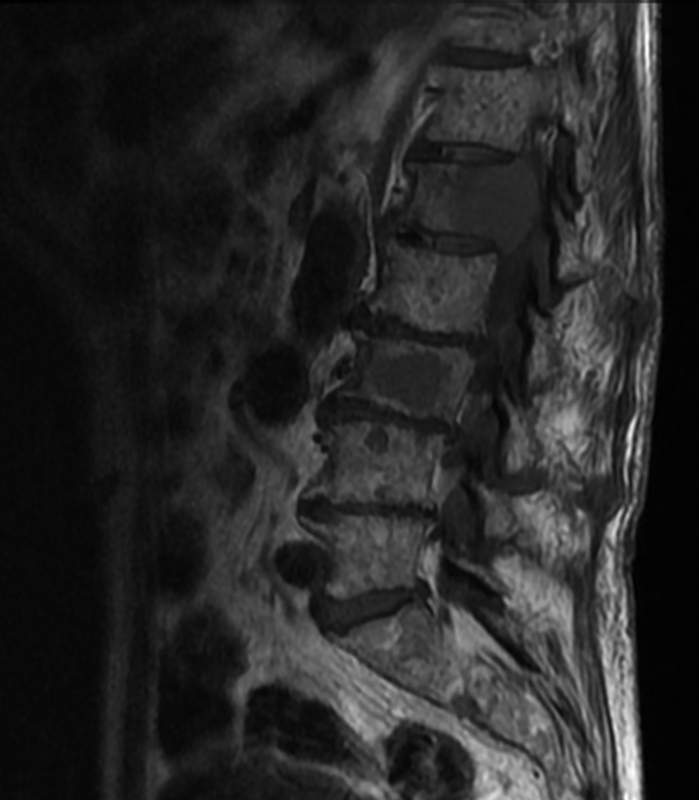 MRI of the lumbar spine demonstrated multiple, multilevel T1 and T2 hypointense lesions and pathologic compression fracture with posterior expansile mass at L1 causing severe spinal and neural foraminal stenosis (Figure 2). 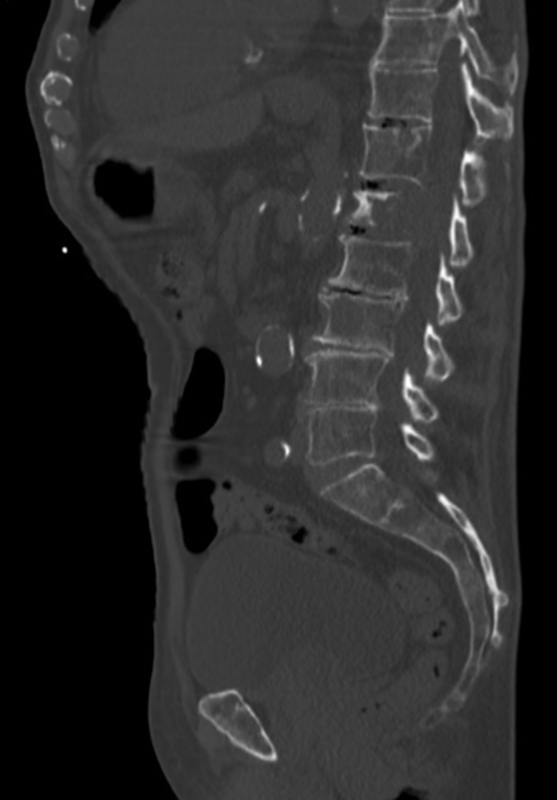 Whole-body bone scan demonstrated non-characteristic increased uptake at the right iliac crest, right 10th rib, and left 4th rib with no areas of focal photopenia (Figure 3). On the third day after admission, CT-guided core needle biopsy of the right iliac lesion was performed, which later came back positive for plasmacytoma. 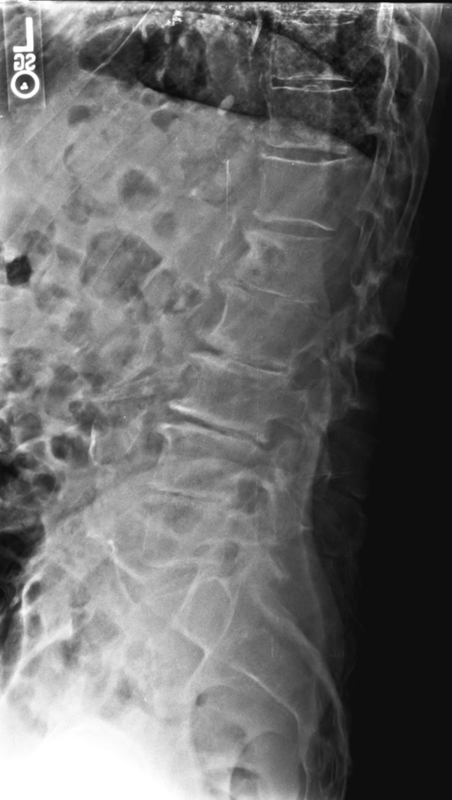 Subsequent myeloma work-up with a radiographic bone survey redemonstrated multiple osteolytic lesions throughout the lumbar spine, pelvis, and bilateral proximal femurs (Figure 4). Multiple myeloma. Primary differential considerations include metastases and lymphoma/leukemia. Beyond a broad spectrum of related plasma cell disorders that are differentiated based on laboratory and clinical findings, the primary differential considerations for multiple myeloma are metastases and lymphoma/leukemia.4 Most imaging features for these entities are similar and nonspecific; however, one feature that may favor metastases, lymphoma, or leukemia is increased uptake on bone scan.2,4,5 More extensive or isolated involvement of vertebral posterior elements, less well defined or absent cortical destruction, and lack of associated monoclonal gammopathy and proteinuria may also help differentiate these entities from multiple myeloma. Our patient initially presented with signs, symptoms, and clinical history strongly suggesting genitourinary pathology; however, incidental discovery of multifocal osteolytic lesions on his initial NECT led to a very different diagnostic work-up. On imaging, our patient had many of the characteristic but nonspecific findings of multiple myeloma. However, due to this nonspecific nature, imaging alone was insufficient for diagnosis and histopathologic and clinical correlation were ultimately key for differentiation. Clinically, our patient also demonstrated most of the classic signs/symptoms of multiple myeloma, with the exception of hypercalcemia. Diagnosis was eventually confirmed with core needle biopsy. This case demonstrates the at times difficult nature of diagnosis and differentiation of multiple myeloma from other entities such as metastases, lymphoma, and leukemia. Our 93-year-old patient presented outside the normal age range of 40-80 years and initially presented with clinical findings and history most suggestive of genitourinary pathology. 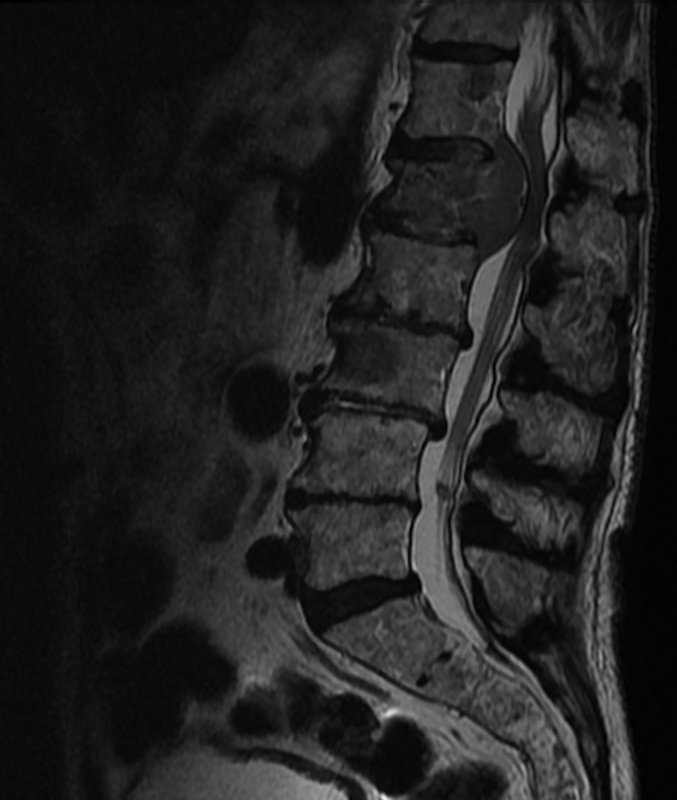 Characteristic imaging findings were present in our patient, including multifocal osteolytic lesions with an isolated expansile lesion and associated soft-tissue component, vertebral compression fracture, and diffuse osteopenia. However, it’s important to remember that these are nonspecific findings and histopathologic and clinical correlation are essential to diagnose and differentiate multiple myeloma. Classic clinical findings of multiple myeloma include: bone pain, hypercalcemia, chronic renal insufficiency, anemia, positive serum/urine IgM, IgG/IgA M spike on SPEP, positive urine Ig light chains, and increased serum beta-2-microglobulin; all of which were present in our patient except for hypercalcemia. Angtuaco EJ, Fassas AB, Walker R, Sethi R, Barlogie B. Multiple myeloma: clinical review and diagnostic imaging.Radiology. 2004;231(1):11-23. doi:10.1148/radiol.2311020452. Hanrahan CJ, Christensen CR, Crim JR. Current concepts in the evaluation of multiple myeloma with MR imaging and FDG PET/CT.RadioGraphics. 2010;30(1):127-142. doi:10.1148/rg.301095066. Navorro SM, Matcuk GR, Patel DB, et al. Musculoskeletal imaging findings of hematologic malignancies.RadioGraphics. 2017;37(3):881-900. doi:10.1148/rg.2017160133. Vogler JB, Murphy WA. Bone marrow imaging.Radiology. 1988;168(3):679-693. doi:10.1148/radiology.168.3.3043546. Woolfenden JM, Pitt MJ, Durie BGM, Moon TE. Comparison of bone scintigraphy and radiography in multiple myeloma.Radiology. 1980;134(3):723-728. doi:10.1148/radiology.134.3.7355226. Hull C, Kliewer B, Lovin J. Multiple myeloma. Appl Radiol. 2018;47(8):28-30. Prepared by Dr. Hull while a Radiology Resident, Dr. Kliewer while a Radiology Resident, and Dr. Lovin while an Associate Professor of Radiology, at Hemet Valley Medical Center, Hemet, CA.